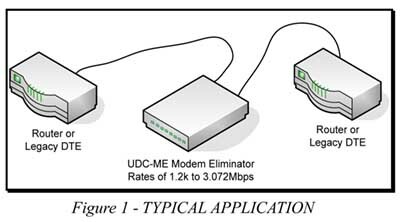 The UDC-ME allows two DTE devices (such as routers) to communicate within proximity of each other. The UDC-ME transmits data bi-directionally at clock rates of 1.2k up to 3.072Mbps between DTE devices. All clocking and signal crossover are provided within the UDC-ME. The unit is equipped with two interface slots that allow a host of serial interface cards to be utilized. The serial interface cards available are RS-232, RS-422/449, RS-530, X.21, V.35 and HSSI. The Serial Interface cards are interchangeable and may be mixed such as RS-232 to V.35 thus eliminating the need for an interface converter or changing expensive serial cards on a DTE device such as a router. 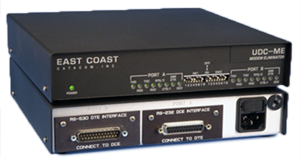 The UDC-ME is also an excellent choice for testing router-to-router connections via the serial ports. 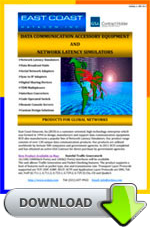 The unit is an excellent choice for interconnecting your LAN or legacy mainframe equipment. Installation is fast and simple by setting the internal switches for Clocking, Carrier Operation and RTS to CTS delay. The UDC-ME has status LED's for each attached DTE device which allows the user to visually confirm the presence of clock and control signals. Also included are options for data or clock inversion.